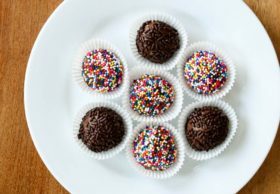 I learned to make brigadeiro, which is one of the easiest candy recipes I’ve ever seen, just in time for the Rio Olympics! Brigadeiro is sort of a chocolate caramel. It’s extremely sweet which means that kids love it and adults will probably be satisfied with just one or two candies. It’s typically rolled in chocolate sprinkles but in the video we used those and some rainbow sprinkles just to be a little more festive. Tuany suggests you could also use minced roasted peanuts on the outside, or even try filling your brigadeiro with a piece of strawberry or cherry. This same recipe is also used to frost cakes in Brazil. If you take the mixture off of the heat a minute or so early while it is still kind of runny, you can pour it over cake as a glaze. Tuany made my birthday cake like that this year and it was so good. It’s important to note that the brigadeiro recipe uses chocolate milk powder, not cocoa powder. We used Nesquick. Cocoa powder would likely work but I have not tested it. You can also try the same recipe using strawberry flavored milk powder and roll the candies in granulated sugar instead of cocoa. Pour the milk, chocolate powder and 1 tablespoon of the butter into a medium sauce pan. Stir with a silicon spatula until smooth. Place over medium or medium-high heat and stir constantly until beginning to bubble around the edges. Reduce the heat to maintain a slow simmer. Continue stirring until the mixture darkens and thickens. Adjust the temperature if necessary to keep the mixture from burning. You want to slowly caramelize it without burning or sticking. Be careful to scrape the sides and bottom of the pan well. After about 10 minutes (give or take a few minutes) the mixture should be quite thick and, when you tilt the pot up it should sort of fall away from the bottom of the pot. This is called ponto de brigadeiro (See the video for a demonstration of what to look for). Smear a little of the reserved butter onto either a plate or a marble slab and spread the mixture out into about an 8″ disk. Let cool about 5 minutes or until cool to the touch. Lightly oil your hands with butter and roll the mixture into small balls about the size of a large grape. Coat in sprinkles and place each brigadeiro into a paper candy cup. These will keep in a container at room temperature for about 3 days. I’m so happy to hear that, Jessica! I made this for the first time, and honestly I thought it would be difficult since some of the reviews said it didn’t set well but, its really easy, and it requires patience – this was a challenge for me since I am impatient… I’m going to make this for my friend who left my school a year ago, and try to convince her to stay to eat my brigadeiros everyday!! ? Thank you for the recipe!!? This was great. My friends and I made 108 of these (and 6 other things) for a school drive and they were a hit. We raised a total of $1,461 for the Alexandria House. 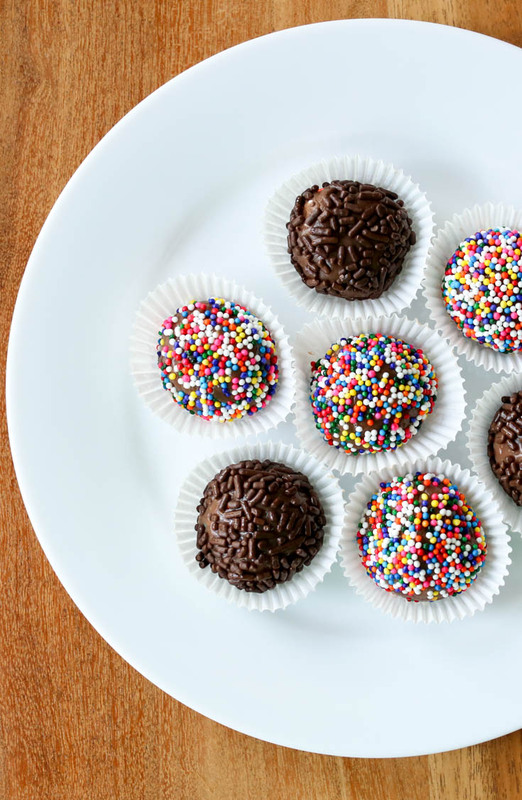 Enjoy these brigadeiro, Beti! I decided to stop making videos after seven years, just ready to focus on other things. I wanted to make some brigadeiro for my Brazillian friend who was missing home, and she loved these! For me, it took about 15-20 minutes with constant stirring to reach ponto de brigadeiro. The video was very useful to know what that looks like and when to stop. It really does just…shlop (for lack of a better word) right from the bottom of the pan. It took about 15-20 minutes to cool to a good malleable consistency. I coated them in chocolate and rainbow sprinkles, crushed peppermint candies, and crushed sliced almonds. Really delicious and turned out fantastic. Thank you so much for sharing this recipe with us, Hilah!